Where Did Boston College Go Wrong? Despite earning a surprising win against Auburn on Monday night, Boston College sits at just 5-5 on the season with losses to Harvard, Hartford and Nicholls State already on its resume. It’s no stretch to note that the Eagles are off to another tough start for what seems like the 100th season in a row. Still, it wasn’t that long ago that the program was riding high. Despite finishing over .500 just once since 2010-11 and enduring a sustained funk over the last five years that few major conference programs have endured, the Eagles under former head coach Al Skinner notched seven NCAA Tournament appearances in nine seasons during the 2000s. As the sixth year of disappointment quickly moves toward conference play, the overarching question is where did Boston College go wrong? Skinner’s final season ended with a record of 15-16 (6-10 ACC), but the hiatus of talent that left with him had an immediate effect. Former ESPN 100 recruit Rakim Sanders decided to transfer to Fairfield, and incoming recruit Brady Heslip, who went on to become a major contributor for several successful Baylor teams, was released from his letter of intent. After Skinner had brought in two ESPN 100 recruits in his first two classes of that recruiting service’s era, the combination of Steve Donahue from 2010-14 and current head coach Jim Christian (2014-present) have combined to bring in just one — Ryan Anderson, who also transferred out, incidentally — in the seven classes since. Unusual Suspects – The last time Harvard failed to receive a first-place vote in the preseason Ivy media poll, Cornell was wrapping up its three-peat in a season that would see the Big Red ultimately advance to the Sweet Sixteen. Five Ivy titles and four NCAA appearances later, the Crimson finds itself slotted fourth while the first-place votes were split as evenly as possible across the three favorites: Columbia, Princeton and Yale. Those three schools have combined for just one NCAA appearance over the last 11 seasons, and the Lions and Bulldogs haven’t made the Tournament since the 1960s. Yale arguably has the inside track after winning a share of the Ivy title last season, but Princeton returns all of its key contributors from a team that finished a strong third, and Columbia not only brings back a substantial portion of its squad but also adds former first-team All-Ivy forward Alex Rosenberg, who missed last year with a Jones fracture in his right foot. Last place or not last place? It’s not easy taking over a slumping program in a conference that just added three perennial Top 25 programs. It’s even harder when you can’t start until April and you lose your two of your three best players before you even take the job. That’s where Jim Christian stands a little over six months after replacing Steve Donahue. Perhaps his most important battle, though, was won when Olivier Hanlan decided to stay in Chestnut Hill. Hanlan’s presence — along with a graduate transfer and a healthy center — are the only reason this is a burning question at all. Any look at Boston College this season has to start with Christian, a former coach at Kent State, TCU and then Ohio before coming to Chestnut Hill. He built a solid MAC program at Kent State, improving nearly every year while he was there. During his last year at TCU, he turned one of the worst programs in the country into a middling Mountain West team with a few solid wins (including one over Virginia). But there’s not much data from which to judge his time at Ohio, and he’s never coached in a major conference. Bruce Pearl still has a few months left on his show-cause penalty, but that isn’t stopping Auburn from hiring him to a six-year deal worth $14.7 million. Since it appears that the NCAA won’t raise any objection with the hiring (the lead investigator on the case works for Auburn now) it seems like a great move by Auburn. We would be tempted to question Pearl’s decision to take the Auburn job, but when you have been blacklisted by the NCAA for three years and technically still are you have to take what is available. Our only question is that now that the door has been opened by Auburn, how long will Pearl stay there before moving on to a better job. The school appear to be weary enough of that they included a clause where he will have to pay $5 million if he leaves within two years meaning that he will actually lose money on the deal if he does so. We would not have considered Boston College’s decision to fire Steve Donahue that surprising if not for Pete Thamel’s recent report that they were retaining Donahue. Assuming that Thamel’s sources were good it is a pretty abrupt change of course for the program. Having said that it seemed like it would only be a matter of time before Donahue was gone as he was 54-76 in four seasons with his first season being by far his most successful. Boston College is one of the more interesting job openings because many people consider a spot with great potential because of its proximity to several great AAU and high school programs, but nobody has been able to tap into that potential. Donahue was not the only big name who was shown the door yesterday as Washington State fired Ken Bone yesterday. Bone went 80-86 in five seasons and had a difficult task of following up Tony Bennett, who went 69-33 in his three seasons there while leading the Cougars to two NCAA Tournament appearances including a Sweet Sixteen (and is also doing an ok job in Charlottesville). Pullman might not seem like a great destination to the outside observer, but it is still in the Pac-12 and has quite a bit of talent in the region to draw from. If they are able to lure one of the names mentioned in the link above they could be competitive in the Pac-12 in the not too distant future. We had almost forgotten about the strange circumstances under which Providence suspended Rodney Bullock and Brandon Austin. The pair of prized freshmen were suspended on November 6 for “not upholding their responsibilities as student-athletes” and nobody paid much attention to it after that except when Austin transferred to Oregon. Now it appears that a woman is claiming that the pair sexually assaulted her on November 3–three days before they were suspended. We aren’t going to say that the two events are related, but the optics don’t look good. Outside of the obvious legal implications we have to wonder what this will mean for Austin, Bullock, and Providence administrators. The transfer market is starting to heat up as two big names–UNLV’s Bryce Dejean-Jones and Temple’s Anthony Lee–entered it in the past few days. Dejean-Jones was UNLV’s leading scorer this year, but had some off-court issues that likely led to his decision to transfer for his senior year. He is on pace to graduate this summer so he will likely be able to play next season with the graduate student transfer waiver. 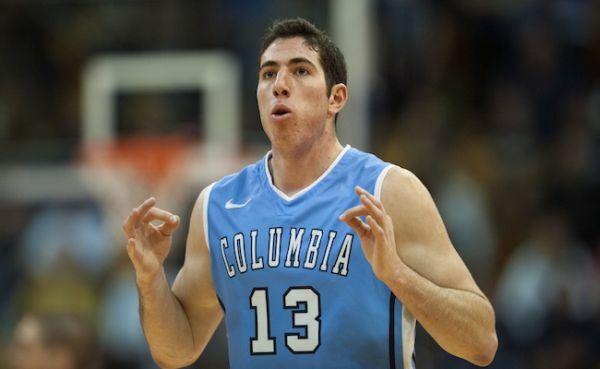 Lee averaged 13.6 points and 8.6 rebounds per game and has also decided to transfer for his senior year. Lee has already graduated and is expected to use a graduate student transfer waiver. The coaching carousel continues to turn with most of the movement off of it. The latest departure is Ben Braun, who was fired after six seasons at Rice. As it appears to be the trend these days Braun officially “stepped down”, but when you go 63-128 you don’t really step down as much as the school lets you save face especially when the biggest story of your tenure was about accusations of your athletic director making racially insensitive comments towards your players and an assistant coach that were reportedly ignored by you and your staff. Braun’s time at Rice might not have been that successful, but he does have 613 career wins (465 at the Division I level) and made it to two Sweet 16s so he will probably end up being an assistant in the not too distant future. One job that apparently will not be opening up is Boston College as they have reportedly decided to stick with Steve Donahue. 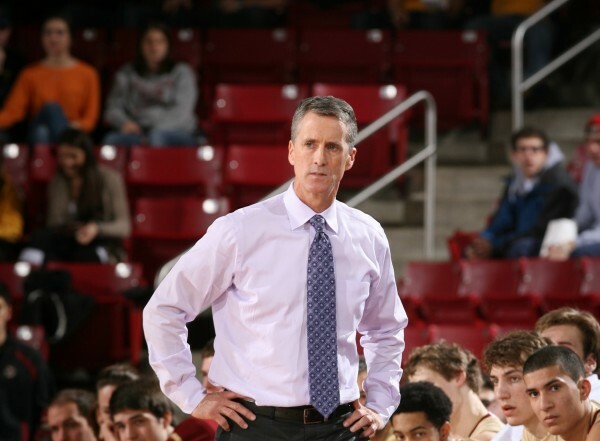 Given Donahue’s 54-76 record it would not have been shocking to see Boston College move in a different direction, but it is somewhat refreshing to see a school give a coach a little more time to work things out particularly at an ACC school. Having said that Boston College was one of the most disappointing teams in the country this year going 8-24 despite having a roster that most would consider competitive to at least be in the middle of the ACC standings. Donahue should expect to have most of his rotation back for next season so perhaps the school is giving him one more season to show some improvement before they decide to move on. It seems like we are dealing with a lot of cases where schools attempt to dismiss a student-athlete only to have the student fight back. One of the most notable involves Dez Wells, who was dismissed from Xavier only to end up at Maryland and play right away thanks to a NCAA waiver. In addition to obtaining that waiver Wells also sued the school for his dismissal claiming that they ignored the evidence the prosecutor provided. Xavier tried to have the suit dismissed, but on Tuesday a federal judge refused Xavier’s motion to dismiss the case. The judge also denied Wells’ request to have his appeal overturned, but it appears that Wells will get his day in court against the school. If you are looking for a potential cult figure to latch on to for the NCAA Tournament you could do a lot worse than Ethan Wragge. You probably know Wragge from his tendency to shoot and make ridiculously deep three-point attempts. You may have seen his performance against Villanova or if you are a regular reader of this column you have probably seen Luke Winn’s shot charts for Wragge. When you combine that with how great of a college player his mother was you have the potential for a frequently mentioned story in March particularly if Wragge (and some guy named McDermott) can lead the Bluejays deep in the NCAA Tournament. We get hear plenty of stories during March. Usually they are inspirational, but sometimes they are just dumb. The one involving a deluded Kentucky fan who got a tattoo “2014 Nati9nal Champions UK” definitely falls into the latter camp. Doing this in the preseason would have been a little presumptuous, but the fan got the tattoo yesterday. The ridiculousness of doing that might be the primary focus of this story, but our favorite part has to be the tattoo artist, who asked that his now nationally (in)famous tattoo not be attributed to him and instead asked to not be named. 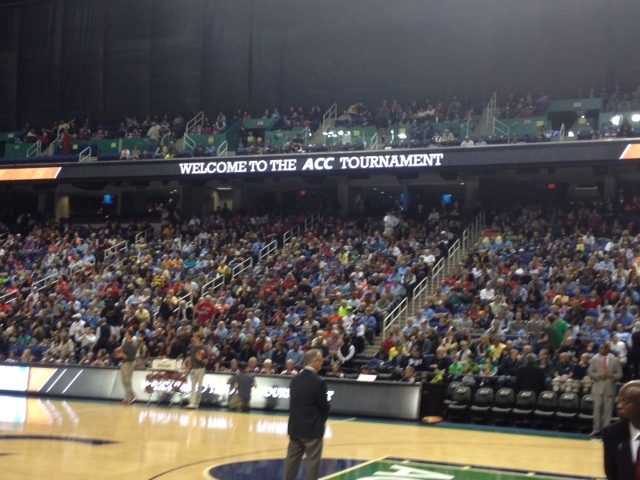 For the first time in its storied history, the ACC Tournament is a five-day event. Of course that was a necessary evil of expanding the conference to 15 schools, but Wednesday afternoon’s action represented the dawn of a new era in tournament history. In the afternoon session, two coaches positioned on the proverbial hot seat led their teams with mixed results. Twelfth-seeded Wake Forest shot a season-high 61 percent on its way to a 81-69 win over #13-seed Notre Dame; while in the second game of the day, #15-seed Virginia Tech hung close but fell 57-53 to #10-seed Miami. Knowing that interest for the opening round games was not going to be very high, the ACC decided not to include Wednesday’s games as part of its ACC Tournament ticket package. With most traveling fans reluctant to come to Greensboro that early, the ACC office also knew that attendance would be low. The league therefore decided to curtain off the Coliseum’s upper level for today’s games, like when UNC-Greensboro plays its home games in the building. The result is a more intimate-feeling arena, but the real goal is to avoid the embarrassment of exposing all the empty seats in the vast upper level of the Greensboro Coliseum. Estimating crowd size is an inexact science but there appeared to be around 6,000 to 8,000 fans in attendance for the afternoon games. Since Ken Pomeroy first rolled out his ratings for the 2002-03 season, no team has finished with an offensive efficiency above 124.0 (a record set by Chris Paul and Wake Forest’s 2004-05 team). After trouncing Boston College on the road with its second most efficient game of the season, Duke’s adjusted offensive efficiency for this year is now an astounding 128.9 points per 100 possessions. 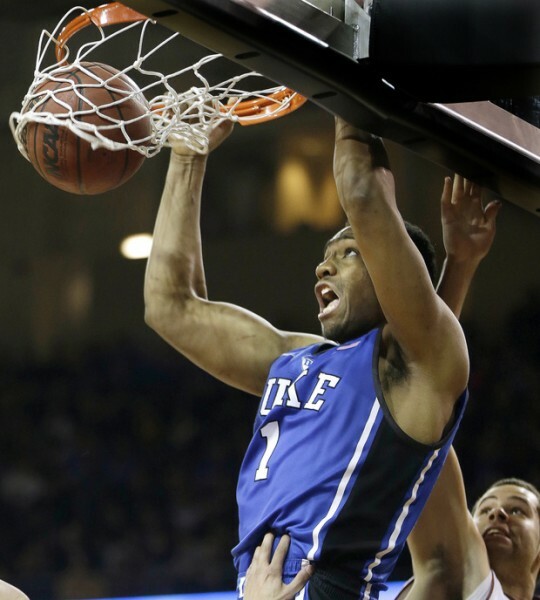 The Blue Devils steamrolled a small Eagles team with an unbelievable performance from Jabari Parker, who finished with 38 points on 17 shots (leaving five points at the free throw line). They did it with an opening 32-9 run in the first 11 minutes of the second half. They did it dominating points off turnovers (15-3) and second chance points (22-7). Admittedly, Boston College’s defense leaves a lot to be desired. Good defense doesn’t give up nearly 70 percent shooting over the course of a half at home. But Duke’s offensive polymathy is what makes them so dangerous. Duke normally has four three-point shooters on the floor at any given time. Once entirely ignored by Seth Greenberg, Tyler Thornton is shooting nearly 53 percent from three-point range (mostly wide open spot-ups). Five truly dangerous shooters (not counting Thornton despite his gaudy percentage) makes Duke a lot less susceptible to “dying by the three,” instead riding the night’s hot hands up the scoreboard. Syracuse Post-Standard: I’m late to the party on this Post-Standard series, “10 Reasons why Duke is hated.” First let’s talk about the piece from Tuesday on Duke’s lack of NBA success. It’s fair to say Brent Axe is standing in a glass house here — and we won’t even talk about the “I could do 10 posts on bad calls Tim Higgins has made against SU alone” comment. Syracuse has had two NBA All-Stars since Jim Boeheim took over: Carmelo Anthony and Derrick Coleman (who only went once). That’s three fewer than Duke over the last 10 years. But Wednesday’s piece takes the cake, with Axe writing what feels like a fanboy blog piece on Duke’s “dark side.” This isn’t to say the national media doesn’t put Duke on a pedestal — it most certainly does. But long story short, this series looks pretty ridiculous on a newspaper blog (a paper, theoretically capable of reporting on scandals in the conference), and crosses the fine line between fun trolling and unprofessional potshots. Daily Orange: In a better example of Syracuse journalism, the student paper continued its “2-3 Series” talking about how Jim Boeheim teaches his teams to feel the zone instead of “reacting” to the play. Specifically, it looks at Hakim Warrick, who — like most post players — took time learning the rotations. That’s one reason I (and Stephen Bailey) don’t think Jim Boeheim will ever fully embrace the one-and-dones. All it takes is one disinterested or lost player to ruin a zone (unlike man-to-man, where you make sure a weak link guards a non-factor). ACC: The ACC announced this year’s ACC Legends, which will be honored at the ACC Tournament in March. It’s a good thing the league is expanding because it’s really having to stretch on some of these — no offense to Sam Ivy, who was a “linchpin” in Bob Staak’s teams at Wake Forest — teams that never made the NCAA Tournament. I was happy to see Julius Hodge honored for his nine four years of playing for NC State. And Al Thornton probably deserves to be an ACC legend based on this play alone. Boston Globe: Boston College was 5-14 going into its game against Virginia Tech last night (winning by 24). Steve Donahue admits to over-scheduling his team, but he would have been killed for playing a Clemson-like schedule. He also cites Ken Pomeroy’s numbers as proof of Dennis Clifford’s impact on his team’s defense. The only question now is how many wins Donahue needs to notch to keep his job. Cardiac Hill: Pittsburgh has a lot of wins, but is is still missing a marquee victory that helps its resume stand out. A down conference and horrid non-conference schedule doesn’t make the search for a capstone win any easier. The Panthers have two more chances for a good one — at home against both Virginia and Syracuse. Losethose games and you could be looking at a 25-win major conference team that somehow ended up on the bubble. The Panthers also have the conference tournament to prove their worth, but time is running out. EXTRA: McDonalds All-American teams were announced on Wednesday and seven (eight if you pretend Maryland isn’t leaving next summer) will play in the ACC next season. Four will play for Duke and three for North Carolina. Syracuse recruit Chris McCullough would likely have been a burger boy, but he’s ineligible for the recognition as a fifth-year player. VIDEO EXTRA: The ACC Digital Network is doing an interesting series miking up coaches from around the league. Here’s Virginia Tech’s James Johnson. Boston College has had a resoundingly disappointing season, to say the least. Coming into the year with elevated expectations based on their youth and potent inside-out combination of Olivier Hanlan and Ryan Anderson, the Eagles have not even held a .500 record yet. Their defense is porous, ranking an astonishingly bad 298th in the nation out of 351 Division I basketball teams. They also haven’t shot the ball well from deep, yet have persisted in making it a staple of their offense. A top-40 schedule with games against UConn, Providence, UMass, USC, Maryland, Toledo and VCU have all resulted in losses. At some point this team needs to win a few marquee games in order to thrive in a top-heavy ACC, and although they won’t lack for those opportunities, it seems like the rest of the season will be spent in hopes of securing a non-NCAA postseason bid and building for the future. 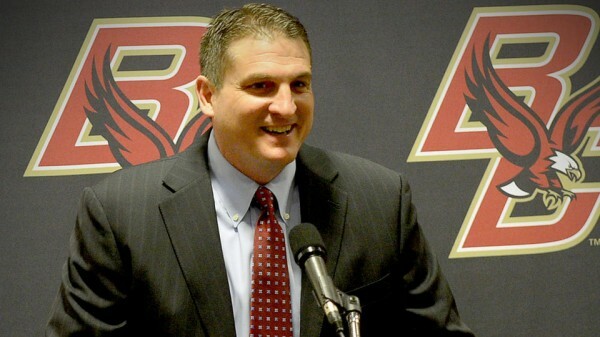 Boston College fans had good reason to believe in this squad coming into this season, as the Eagles returned all of their major players including the ACC ROY Hanlan, versatile big man Anderson, and guard Joe Rahon. The team finished the 2012-13 season relatively strong, winning four out of its last five games with an extremely young team that lacked depth and ACC experience. Much was made out of the momentous leap expected from Hanlan, the seemingly unstoppable Canadian guard who dropped an ACC freshman record 41 points in the first round of last year’s ACC Tournament. For my money, the best game in recent days was Iowa State’s thrilling win over Iowa on Friday night at Hilton Coliseum. This game was the true essence of what college basketball is all about. It was a heated in-state rivalry between two quality teams in a crazy atmosphere, smack dab in the middle of a basketball-crazed state. It is simple: This was a fun game, period. Although Fred Hoiberg’s Cyclones came away victorious, you may be somewhat surprised to find out that my biggest impression taken from this game was just how good Iowa is. I actually thought the Hawkeyes were the better team for most of this contest. Don’t get me wrong, Iowa State played really well. After all, it beat a team I thought was very impressive so that should tell you something about the Cyclones as well. I thought Iowa had a terrific game plan and evidence of top-notch coaching and scouting was present throughout the game. One specific example of great scouting came late in the first half when Roy Devyn Marble got in the middle of a dribble hand-off by Georges Niang and broke it up, leading to two Iowa points on the other end. Marble read the play perfectly and it paid off for his team. Fran McCaffery’s squad excelled in transition and got almost anything it wanted offensively on the low block with Aaron White leading the charge. Iowa ran some beautiful half-court sets that resulted in plenty of clean looks, especially for White and Marble. The Hawkeyes dominated the glass (but did not take full advantage of it) and answered the bell nearly every time Iowa State put together a charge, except for the final minute where it wound up costing them the game. Iowa simply didn’t make the plays it needed to win late, highlighted by Mike Gesell’s two missed free throws. McCaffery and his team can learn a lot from this game but in the end it is on the players to step up and lead down the stretch. Whether that’s Marble (most likely), White, Gesell, or someone else, Iowa needs someone to be “the man” in order to take the next step and contend at the very highest level in the Big Ten.